Zhuang Hui is an artist and a curator. Over Zhuang Hui’s three decades of artistic practice, his mediums span from painting to installation, video art, and the most recognized, photography. However, we cannot refer to him as a photographer, because the techniques that articulate the photographic language is not what interest Zhuang Hui. Instead, he has adopted photography for its most essential function – documentation. As the artist traversed and intervened in this world at large, photography became the most direct and convenient mean of documentation. Similar to painting and installation, the stillness of this art form provides its viewer the moments to "gaze", and search for the sight through movements, gauges, and distinctions, so the barriers between memories and imaginations would be lifted ad infinitum. This is also the reason for our profound sentimentality time and time again when we look at Zhuang Hui’s One and Thirty and Group Portrait Photo Souvenir twenty years since they were first unveiled. If we were only to consider Zhuang Hui as a conceptual artist without learning about the underlying clues, we would easily conceive these worldly travels and these images depicting removed social issues he addresses as his nihilistic escapes or a romanticism of “returning to nature”. One of these implicit clues is to consider Zhuang Hui as an "art labor" and "art wanderer", as well as a reason for the uniqueness, importance and unclassifiable position Zhuang Hui holds in the field of Contemporary Chinese art. It is often unnecessary to romanticize an artist’s personal history and experiences, yet the importance still seems apparent now. Zhuang Hui’s parents passed away in his childhood, and from age 16, he became a worker at the Luoyang Tractor Factory for the next 19 years, until 1997. This kind of life experiences made him empathetic to people of the working class, who was more than comfortable to stand next to the workers and exposed his ivory teeth in One and Thirty and Group Portrait Photograph Souvenir. Either the individual or the collective documented in these “artistic” project has exuded a radiance of humanity, and the emotional ties of being “together” was what Zhuang Hui sought out internally. To call Zhuang Hui an "art labor" is not only because of his lasting concern and representations of this class of people, but leading the life of a worker is a necessity for him. Two decades ago, Zhuang Hui said, "When I travel, I prefer to walk, and take long-distance buses like the locals, and sleep over on mud-built beds that cost two kuai per night”. Although living in the cities where material goods have become abundant, this way of life remains a necessity for Zhuang Hui, both for physical and emotional reasons. Over the decade he photographed the Everything series, the reason for him to leave the cities and march towards the “barren” plateaus in the Northwest, I think is perhaps because of the people and their lives there have always been appealing to him in discrete ways, in spite of not having assumed the protagonist role in the images of Everything. "Wandering" is the way Zhuang Hui reflects and solves issues. "Without any parental guidance in my childhood, when I encountered problems that I couldn't resolve, I'd get on a train to a land far away. Once I get there, I’d realize that I have come to a different place where former problems are no longer problems." The other clue is Zhuang Hui's reconsideration about art since the Yumen Project. Historically, art has been a tool (religious, or serving utilitarian purposes such as the policies stipulated on the Talks on Art and Literature at Yan’an), a school of thought, an ism (modern art) and etc., however contemporary art today would not suffice to fulfill the manifesto of any community, neither would it be able to represent any kind of progress. The great artists in the history of humanity merited their greatness by offering their individual perspectives, while the meaning and appeal of contemporary art could only embody the values of the individual. Life and society today spiral down with the introduction of policies, capital and technology, and have become increasingly procedural, codified and stereotyped, as these policies, capitals, and technologies have brought about greater control. How should we avoid the tendency of cultural homogeny and preserve certain exceptional status, so the flowers and grass would grow freely in the wilderness, rather than planted collectively in a greenhouse. The greater differences in mode of thinking and exploration among contemporary artists are, the greater possibility there will be to achieve this goal, or even in becoming a better approach to criticism. After the Yumen Project, Zhuang Hui began to reflect on the effectiveness of practices that adopt art for social transformation. Lu Xun abandoned medicine to engage in literature with the realization that medicine would only cure people’s flesh, while art and literature would make an impact on people’s spirit and soul. Likewise, Zhuang Hui gave up on his previous artistic practice of social intervention precisely because he had realized that his impact on society was artificial, and even, temporary. He gradually came to the conclusion that the worldviews and methodologies that are internalized, shaped through one’s ability of deliberation and modes of exploration, “that which engendered my own way of concern for the world”, should be the values art offers to the world. Hence, Zhuang Hui, the “art wanderer” and “art labor” embarked on a new phase of his artistic exploration. In comparison to his solo exhibition Qilian Range held at the Galleria Continua in Beijing, this exhibition 1650 B.C. centers on the photography series Everything, by focusing on the artist's pictorial intervention, in the same vein as the unchartered territory in nature, it emanates us into another time and space through these humble means. Although the city is where Zhuang Hui maintains his social relationships and builds his identity, it does not possess what appeals to him the most. As much as the cities are filled with artificial objects and consumer goods, the people who inhabit these urban environments are often only concerned about themselves – about one’s own desires and how to satisfy them, which could lead to rivalries among people for resources and power. Hence, refraining one’s desires and wants for material goods become the pretext for contemplating on metaphysical issues. Intellectuals could explore the wonders of the universe without leaving one’s home, but for Zhuang Hui, who practices what he preaches – walking over time in the unpredictable natural environment, where he touches and observes objects in reality, and opens up his system of perception whole-heartedly – are the ways of approaching the metaphysical life. Humans are beings with imagination and ideas, the development of civilization is a lasting process of being in the cave (or indoors), immersed in artificial notions and the virtual world, but for Zhuang Hui, he needs to walk into the wilderness, towards reality. This kind of wandering or itinerant practice is similar to the “Kun turns into Peng, and flies to the Southern Darkness” described in the chapter, “Free and Easy Wandering” of Zhuangzi. During the course of his journey, what were relevant to nature have been given form in the Everything series. The nature portrayed in Everything is not the luxuriant lush Southern sceneries of “simply being there”, but the boundless and spectacular Northwestern typography around the Qianlian Mountains. Stretched out over a thousand kilometers, Qianlian Mountain, encompassing topographical phenomena such as the Gobi, desert, grassland, and snow-mountain, has become the artist's "studio". This vast space provides people with the ultimate religious experience; when we observe closely at the details found in nature, we lament the inadequacy of artificial objects that fails to attain this level of wonder. What Zhuang Hui hopes to do is to take us into a different space through the images he captures along the way, where people, animals, plants, stones, and rivers are all the messages left by the Creator in this chaotic world, who are equal and connected; being in the temporal framework of this space, human civilization is only the tip of the iceberg. In Zhuang Hui's view, if everyone's life, attention and awareness orbit around the things people do, where an alternative space or mode of operation lacks as a referential vantage point, then the conflating humanity would possess daunting power. Our perception of the world today is largely built on the essential knowledge system of “math and sciences”, which is the classifiable, analyzable, and archetypal mode of thinking. However, while this “worldview” pushes forward the accelerated development in technology, it also creates a tenuous relationship between man and nature and people's narrow understanding of the natural world. In this sense, Zhuang Hui's photographs capture a “natural history”, where he “collects the objects from nature”. His lens has even focused on the cracked vain of the stone, or the plot of land where straw has been burned. In doing so, he’s returned the power of discourse to these specific objects, and allowed their specificity to move us. How could these concrete “expressions” be this diverse and mesmerizing! The scenes and objects appeared before the lens in the Everything series are suggestions and points of departure, with which the viewer could “re-embark” on these temperamental adventures, to weather the elements with various sensibilities according to one's own lived experiences and imaginations. While one exhausts one's physical and mental energies, one will enjoy this sacred journey through time and space. Zhuang Hui was born in 1963 in Yumen Town, Gansu Province, China. He left his hometown to study in Luoyang City at the age of thirteen and started to study painting by himself. In 1979, after graduating from high school, he became a worker at the state-run Luoyang No.1 Tractor Factory. In 1996, he moved to Beijing and became an artist. 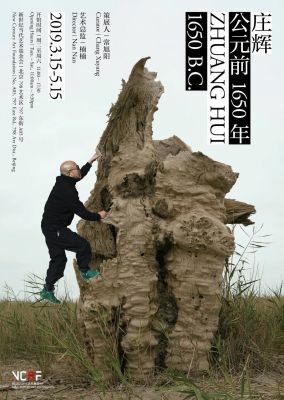 During his engaged and fruitful artistic career, Zhuang Hui participated in a number of exhibitions including Foam Photography Museum, Amsterdam (2015); Folkwang Museum, Bonn (2014); 9th Shanghai Biennale, Power Station of Art, Shanghai (2012); Salt Lake Art Center, Salt Lake City (2009); The Groninger Museum, Gron- ingen (2008); Tate Modern, Liverpool (2007); Galleria Continua, San Gimignano (2006); Haus der Kulturen der Welt, Berlin (2005); Kunstmuseum Bern, Bern (2005); Musée d’art contemporain de Lyon, Lyon (2004); Centre Pompidou, Paris (2003); Deichtorhallen Hamburg, Hamburg (2002); Beyeler Art Museum, Basel (2001); Biennale de Lyon, Lyon, FR (2000); The 1st Fukuoka Art Triennale, Fukuoka Asian Art Triennale, Fukuoka, JP (1999); LCA Contemporary Art Research Center, London (1999); Ghent Art Center, Ghent (1999). He also participated in the 48th International Art Exhibition Venice Biennale, Venice (1999); Visual Art Festival, Kunstverein and Kunsthaus, Hamburg, De(1996).